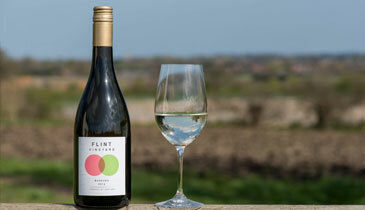 Flint Vineyard is one of England's most exciting new wineries. Winemaker, Ben Witchell, uses a blend of innovation and a respect for tradition to produce elegant and refined award-winning wines. Set in a beautiful location overlooking the Waveney Valley and the bustling market town of Bungay, we offer tours and tastings on Saturdays from April - September. Please book online. Before or after your tour (depending on the time of booking) enjoy a delicious lunch, overlooking the vines or in our tasting room. Sample local cheese, charcuterie and bread from the finest producers, all within 15 miles of Flint Vineyard.